I had a goal for myself prior to the Constructor Craft Fair that I wanted to make enough profit to buy myself two new things: a JoTotes camera bag, and a pretty camera strap. Well, I'm happy to say that I exceeded my goal, and ta da! - here are the fruits of my labor! I've been wanting a JoTotes camera bag for a long, long time now. It seems like JoTotes has sponsored every other blog that I read, and they do giveaways every so often. I think I entered every single JoTotes giveaway I could find, but no dice. I ended up having to put out the money, which isn't exactly cheap... but the money is definitely worth it! 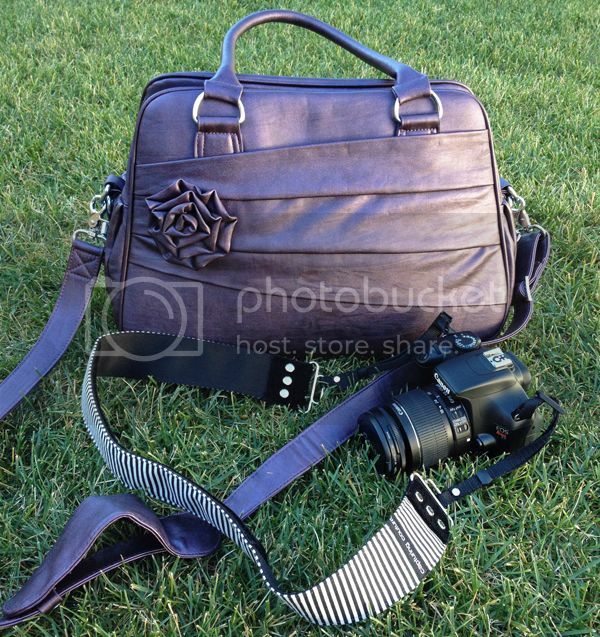 This bag (called Rose, in sugarplum) is SUPER high quality. The construction is really solid, it's incredibly roomy, and has both handles and a removable shoulder strap. Plus, it's one of those purses that comes in its own fancy drawstring sack (in my world, that's a sign of fancy, you know, like bread that's wrapped in plastic twice)! You're given a bunch of padded velcro separators to customize the inside of your bag to fit exactly what you need. In my bag, I put my dslr with the kit lens attached, my telephoto lens, my instax mini, two packs of extra instax film, and an instax mini photo book (the purple thing at the top of the pic on the right above - have you seen these albums from MochiThings?). And there's still room. When we went on vacation, I put all my essential purse stuff (wallet, phone, iPod) into a zippered cosmetics pouch and tossed the zippered pouch into whatever bag I was taking that day: my camera bag, the diaper bag, or my "car" bag with books, magazines, etc. It was a really smart way to travel without having to always carry an extra bag (or two, or three)! My camera strap took a lot of searching to find just the right one (hey, there's a lot of options out there, and you want to choose the one that speaks to you, right?). I ended up finding my perfect strap from B&H photo. The brand is called Capturing Couture, and this design is called "The Rocker" from their urban collection (ha ha it's technically considered the "men's" line). I knew I wanted a black and white striped strap, and this is the perfect one, men's or whatever... the end parts are velvet and there's a nice padded section for your neck. And of course, the best part is that it looks super cool. Apparently, Capturing Couture also makes camera bags, but they look even more expensive than the JoTotes. And I love my JoTotes bag the most! So, although I didn't win any giveaways to score a free camera bag, I can say by my own experience that it is totally worth the money to go out and buy one for yourself! Anyone else out there own a cute and functional camera bag? Share!